Arthur Penton Strong was the son of Arthur and Kate Strong, of Reading. He is commemorated on the footstone of the family grave. The 1891 census indicates that Arthur had three younger brothers and an older sister his father was a builder and contractor. Kate’s brother also lived with the family. They lived at 5. Zinzan Street, Reading. By 1901 Arthur’s father had died and the family were living at 215, King’s Road, Reading. Arthur was now aged 17 and employed as a factory clerk. In 1911 Kate was living at 30. Telford Avenue with her younger sons. It has not been possible to trace Arthur through the 1911 census. 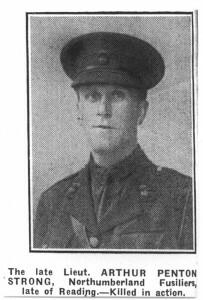 Arthur was killed in action on 26th October 1917, Aged 34. This was the first day of what came to be known as the Second Battle of Passchendaele. On this day the British and their allies improved their positions from Passchendaele to Poelcapelle. Matrix tells us that the attack began at 5.40am. On either side of the Menin road the British 7th and 5th Divisions were frustrated by marshes. The Australians and Canadians took their objectives moving off in a mist that became a heavy rain as the day progressed. The Canadians had 70% casualties. Poelcapelle means church in the bog and it was in a bog that the British fought. Several days later New Zealand troops came upon the remains of the Northumberland Fusiliers and Durham Light infantry lying in rows where they had been mown down by German machine guns as they had made their advance on the first day of the battle. This cemetery was made after the Armistice by the concentration of graves from other cemeteries and from the battle fields. The great majority of the dead fell in the last five months of 1917, particularly the month of October. 19th Company (Chester) Royal Army Medical Corps. Ernest Stubbington was the husband of Catherine H. Stubbington, of 58, Brickfield Road, Portswood, Southampton. 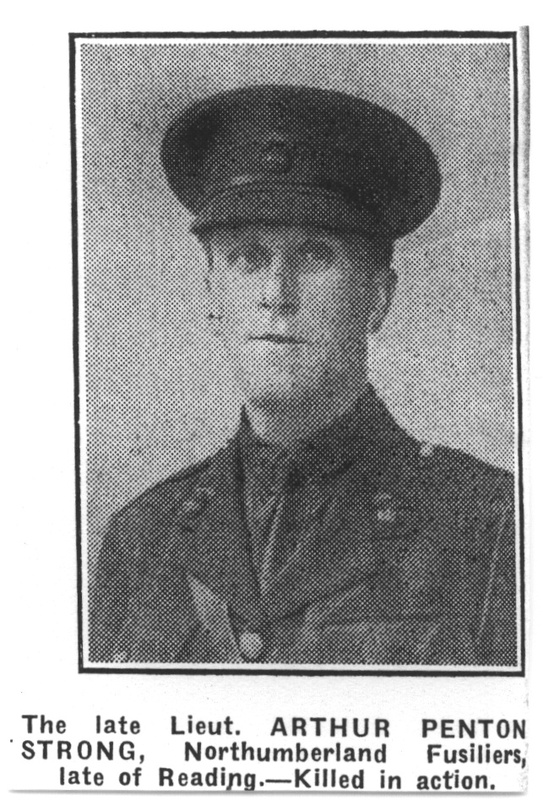 Ernest Stubbington died on 12th July 1917, aged 37. He took his own life and the Reading Standard published the following information. Ernest Stubbington, aged 37 years, a Private in the R.A.M.C., had been married for 18 years and had 6 children. He was “described by his widow and his military officer as being of jovial disposition, and getting on well with his work”. “He committed suicide on the railway line last week”. He was called up for military service on May 15th last, and was engaged in office work in Whalley. Granted 4 days leave, and a pass from Saturday to Tuesday, he went home to Southampton. He left there Monday morning in order to join his unit by Tuesday midnight. The body was found on Thursday morning on the line from Reading to Paddington near Woodley Bridge. The back part of the skull had been torn away. In one of his pockets a piece of paper , bearing the pencilled words “Only a nuisance”. A verdict of premeditated suicide was returned. The widow said her husband had been depressed for about 12 months, though for no particular reason. He had complained of bad eyesight and also of his heart. She couldn’t account for the tone of the letter, there was no reason to refer to her in that way. She did not think he had friends in Reading or that he had been “carrying on” with other women. The Quarter Master at Whalley spoke well of his military character.